Hi! I'm Connie Sue Haidle, an applique quilt designer/teacher from Webster City, Iowa. 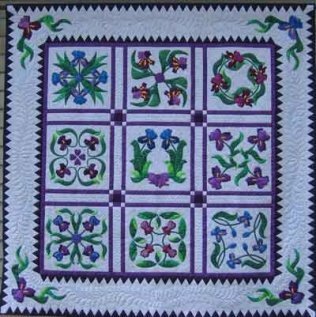 I began my business, Apple Blossom Quilts, in 2004. The first month I introduced the first block of "My Christmas Baltimore". I sold two patterns. I thought that was pretty good as I'm sure very few people had ever heard of me. My newsletter started the first month I was in business. It grew very quickly. Today I have over 9000 subscribers world-wide. It's so much fun to look through my subscriber list. I have subscribers in the US, Canada, Mexico, Australia, most Eurepean countries and several African countries including South Africa. 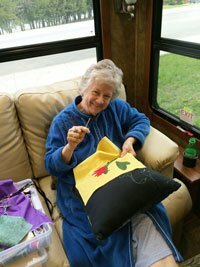 Me appliqueing in my pj's early in the morning in our camper. I publish my newsletter around the 15th of each month. It's free and you can subscribe very easily. Just click on this link. It will take you to my subscriber page. Enter your e-mail address. When you are done, use your back arrow to return to this newsletter. 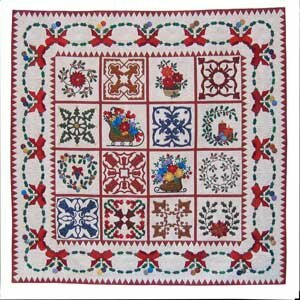 "My Christmas Baltimore" was the first quilt I designed and made for Apple Blossom Quilts. I'll be bringing it to your guild as a part of my trunk show. I almost always have a free pattern each month. In the past I have offered these free patterns through my newsletter. In January I started a new free BOM that I am handling differently. My new freebie is a 100 block quilt made up of 6" blocks. I'm offering 1 block every week. The quilt is called "Connie Sue's Sketchbook". A sample of the block are in the row above. I publish 1 block every Monday morning. It is offered for two weeks. After that it is moved to my catalog. If you miss a pattern it is very simple to go to the catalog and download the missing block. These blocks are offered at the very low price of just 50 cents. You can get get these blocks by clicking here. Coming to your guild .... soon! I think I got the cart before the horse. I failed to mention that I'll be coming to your guild this fall. I've created 5 introductory newsletters that will be coming your way. This is the first. I'll introduce myself to you, tell you a little bit about what I do, share photos of my quilts and even provide a supply list for my classes. Hopefully I won't be a stranger by the time I visit your guild. The quilt to the right is called "Iris On Parade". It is also one of my earliest quilts. It will also be included in my trunk show.